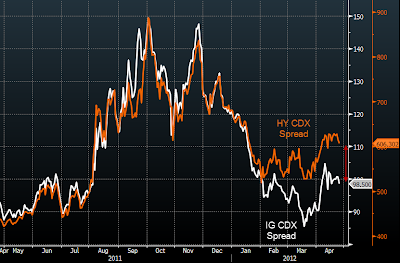 Based on recent history, the investment grade (IG) CDX is still outperforming high yield (HY) CDX. That is on a relative basis IG spread is tighter - now back below 100bp. Portfolio managers who bought IG protection as a hedge or simply to bet that spreads will widen are bleeding premium without the reward. 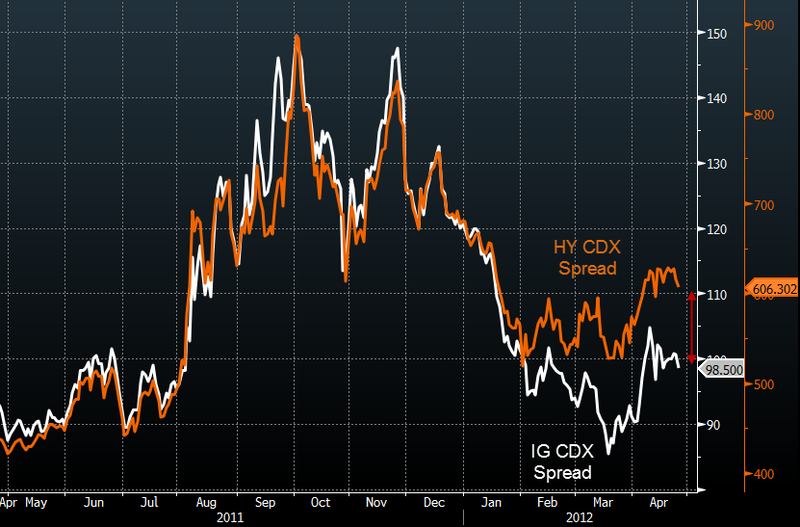 Just as was the case with VIX earlier in the year, CDX IG has become a poor generic hedge against spikes in risk. Part of the reason may be that banks such as JPM are hedging their own bonds (DVA). Note that CDX IG has a substantial financials component. That means even if dealers sell financials protection against their bonds (and not the whole index), it will still keep CDX IG relatively tight. And betting against JPM or other dealers may be a losing battle.